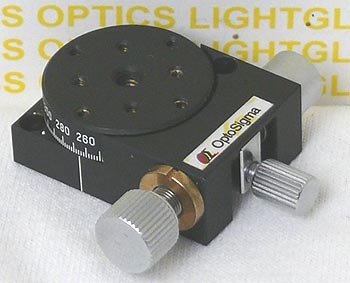 The OptoSigma 124-0010 25mm Rotation Stage is OptoSigma's smallest rotation stage. Only available as a metric item, the top of this stage measures 25mm in diameter. This rotation stage will support a 3 Kg load, yet only measures 13mm high. The Vernier allows 20 minutes of resolution, and the total fine adjustment range is +/- 5 degrees.